When the NCAA made the decision to cut the shot clock by 5 seconds, plenty of people rejoiced. Casual fans and national sports pundits praised the new rule as a move to the 21st century. Most coaches and players probably loved the chance to speed up the pace and inject more action into the game. Overall, the approval rating on the new shot clock was positive by a large margin. Virginia head coach Tony Bennett likely had some problems with the change. His UVA teams have played at one of the ten slowest tempos in the nation each of the past four seasons and have not placed outside the 15 slowest teams since Bennett’s first season. Publicly, his comments about the shorter shot clock were mixed with a tinge of positivity, though reading between the lines showed a bit closer to his true feelings. The shorter clock was seen as an effort to make the game more resemble the NBA’s frenetic style of play, and Bennett recognized a major difference between college basketball and the professional ranks. Essentially, Bennett pinpointed the irony of the NCAA’s rule change. Everyone wants college basketball to be a more aesthetically appealing product. More points on the scoreboard would accomplish that goal in theory, but the talent ceiling in college basketball means more shots won’t simply produce more scoring. In fact, you’re likely looking at more forced shots, more misses, and an uglier game. Giving teams more time might lead to a slower pace and more idle action, but for teams who use the clock wisely, that extra time provides a greater chance at an open three, a dunk, or a assisted bucket. For true basketball fans, that’s the dream. Virginia has been the wedge between the casual fan and college hoop junkies since Bennett’s arrival in Charlottesville. If you say you love basketball and you say that Virginia is boring, one of those statements is false. Virginia’s methodical, deliberate offense is a godsend for true college basketball fans. They talk about the Hoos ball and player movement in the same way boxing aficionados praise the sweet science or deep football fans discuss the triple-option. Bennett’s offense is something special, without being the only or even the primary reason for the Cavalier’s success. This season, Virginia has coasted to an 11-1 record with five wins over the KenPom top 100. Patient offense has been part of the equation, but Virginia will compete in the ACC and deep into the NCAA Tournament thanks to a variety of factors this year. Tony Bennett’s teams at Virginia have earned a reputation for playing great defense Many point to how few points per game the Cavaliers allow as evidence of defensive success, though that barely scratches the surface. Virginia has not allowed more than 62 points per game in any season since 2012. Some of that can be credited to defense, but the slow tempo of Virginia’s offense also affects opponents’ low scoring totals. Once you account for per possession scoring, Virginia has still been one of the best defensive teams in college basketball over the last half decade. The Wahoos have ranked in the top seven of defensive efficiency each of the last four seasons and rank first in Division I so far this year. Bennett’s pack line defense forces opposing players into tough shots and erases the chance for easy baskets in the paint. This season, Virginia’s opponents have made the 3rd lowest percentage of 2-point field goal attempts, at under 40 percent inside the arc. By cutting off penetration into the defense, Virginia forces playmakers to make extra passes on the perimeter and the Cavaliers have the lateral quickness to recover and close out on shooters. Forcing opponents to work for a shot is as important to Virginia’s pace as the Hoos own offensive patience. 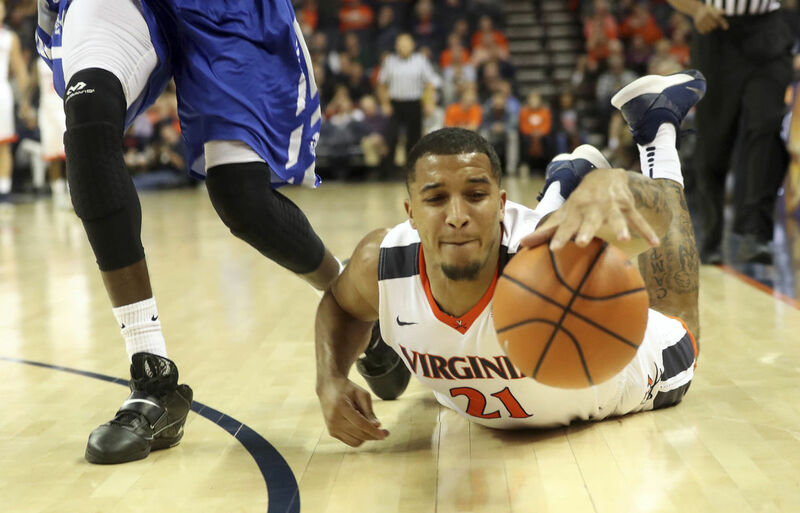 Virginia’s average defensive possession lasts 18.2 seconds, the 17th longest average in the nation. That number is just a tick below Virginia’s 19.9 second average offensive possession. Those two numbers work in tandem to exhaust, frustrate, and stifle every opponent. Those long, uneventful possessions leave teams eager to force shots or passes. Virginia ranks in the top 40 nationally in forcing turnovers and nabbing steals. Any good defensive possession can be ruined in an instant by an offensive rebound. Bennett and his team know this well and do a great job finishing possessions by cleaning the glass. Virginia’s opponents rebound just under 25 percent of their missed attempts, good for 31st best in the nation. The pack line defense is unique in its ability to have players in position to defend, while also in position to box out when a shot goes to the rim. Senior forward Isaiah Wilkins leads the Cavaliers’ efforts on the glass. He only averages 4.7 rebounds per game, though counting stats can be skewed for Virginia players who see far fewer possessions than most. Wilkins is securing 10.4 rebounds per 40 minutes and 16.7 rebounds per 100 possessions. ACC rival Marvin Bagley of Duke is 9th in the nation in rebounds per game and grabs just 2.6 more per 100 possessions than Wilkins. Wilkins, at just 6’7 and playing all over the floor, still manages to rank 12th in the ACC in defensive rebounding rate. Bennett’s deliberate offense only works with the right personnel on the floor. Any team can try to be patient and wait for the right shot, but it takes a superior basketball IQ to truly work for the best shot possible. Once players have the patience and discipline to do so, the shots still need to go in. Working the ball for 30 seconds guarantees nothing against Division I defenders. In his years at the helm, Bennett has learned the importance of players capable of recognizing and taking advantage of scoring opportunities. For Malcolm Brogdon, this meant working for a mid-range jump shot. For London Perrantes, it meant extending his range well beyond the arc. This year’s Virginia team is lucky enough to have multiple players able to make shots from all over the floor. The Hoos are led by a three-pronged attack from the backcourt. Senior Devon Hall and sophomores Kyle Guy and Ty Jerome are all lethal shooters (and yes, I know UVA doesn’t use the words “senior” and “sophomore”). All three have made more than 41 percent of their outside shots, topped by Hall at 47 percent. Guy, meanwhile, is a 48 percent career 3-point shooter, while taking nearly nine deep balls per 40 minutes this season. He can shoot the Cavs back into any game, no matter the deficit. Kyle Guy averaging six three point attempts per game for a team that averages around 60 possessions per game seems almost impossible, especially when you add in three outside shots each from Jerome and Hall. That’s a ton of threes to attempt, given how few shots at the rim Virginia sees in total throughout the course of the game. Fortunately for UVA fans, almost none of those shots are wasted. A whopping 33 of Guy’s 34 made threes this season have come via an assist. When he cuts down on his quick trigger and pull-ups off the dribble, waiting for a more viable opportunity instead, Guy is one of the nation’s most effective offensive weapons. Even with the seemingly high volume of threes attempted, Virginia still knows that its bread is butter inside the arc. The Cavs score more than half of their points on two-pointers, above the national average. The Hoos do all of this on the 4th longest average possessions in the nation. All the actions in Bennett’s offense are designed to lull, move, or force defenders out of position. Virginia has the players and the system to take advantage of any hole in the defense. Combined with the nation’s best defense, Virginia has a real shot at an ACC title, a number one seed, and the Final Four.